At first I thought it is another type of Eagle lol! Well, it is not actually an Eagle, it is a nice example of uses of Eagle in names of symbols. 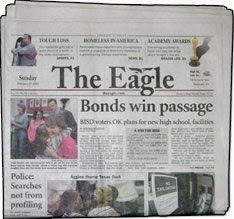 Bryan Eagle is the official Newspaper of the Bryan College in Texas. It has a great popularity in eight countries, and even if it is issued for a college, it is popular with readers of all ages and preferences. It is also one of the oldest publications that still exist, being first printed in 1889 under the name The Weekly Eagle. It won multiple local and even national awards, and it has an average circulation of 20 000 exemplars per day.